Posted under Health Guides. Updated 2 April 2019. Calcium is a mineral that gives strength to your bones. It’s important to get enough calcium during your teen years so you’ll have strong bones now and when you’re older. You may need a calcium supplement if you don’t get enough calcium in your diet. Calcium is a mineral that helps build strong bones. Calcium is also necessary for many of your body’s functions, such as blood clotting and nerve and muscle function. During the teenage years (particularly ages 11-15), your bones are developing quickly and are storing calcium so that your skeleton will be strong later in life. Nearly half of all bone is formed during these years. It’s important that you get plenty of calcium in your diet because if the rest of the body doesn’t get the calcium it needs, it takes calcium from the only source that it has: your bones. This can lead to brittle bones later in life and broken bones or stress fractures at any time. Unfortunately, most teen girls actually do not get enough calcium in their diet. Osteoporosis can be prevented. There are some risk factors that you cannot change (such as your race and your family history), but there are some you can! Eat a healthy diet, exercise on a regular basis, and don’t smoke! Children and teenagers between the ages of 9 and 18 should aim for 1,300 milligrams per day, which is about 4 servings of high-calcium food or drinks. Each 8-ounce glass of milk (whether 1%, 2%, or whole) and each cup of yogurt has about 300 milligrams of calcium. Adults 19 to 50 years of age should aim for 1,000 milligrams per day. For foods that have a nutrition facts label, the amount of calcium in that food is required to be on the label. At the bottom of the label, you will see four nutrients: Vitamin D, calcium, iron and potassium Next to calcium will be a number indicating the amount (in mg) in a serving of that product. You probably know that dairy foods such as milk, yogurt, and cheese are good sources of calcium, but did you know that tofu and beans contain calcium, too? See the list of high-calcium foods at the end of this guide. What if I’m lactose intolerant or have a milk allergy? If you are lactose intolerant or have a milk allergy and can’t drink milk, there are plenty of other ways to get enough calcium. These include drinking fortified soy milk, fortified orange juice, almond milk or lactose-free milk (the lactase enzyme that you are missing has been added into the milk). If you are lactose intolerant, you may also take lactase enzyme tablets before eating dairy products to help digest the lactose sugar in the milk. 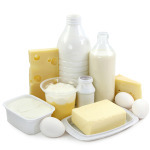 Some people who are lactose intolerant can tolerate having small amounts of milk or other dairy products. There are also certain cheeses, such as cheddar, that are naturally lactose-free. If you have a milk allergy, it is important to talk with your health care provider about what you can eat or drink. Have a bowl of cereal with milk. Use milk instead of water when making oatmeal. Make a healthy breakfast smoothie with a cup of milk or yogurt and a handful of frozen fruit. Add a slice of cheese to your bagel or English muffin. Most cheeses, except for cream cheese, are high in calcium. Choose milk instead of soda at school. If you don’t like plain milk, try chocolate or strawberry milk. Pack a yogurt with your lunch. Add cheese to your sandwich. Look for cereal bars or energy bars that contain calcium. Check the label to see if calcium is listed. Make hot cocoa with milk instead of water. Eat broccoli dipped in a veggie dip made with plain yogurt. Snack on cheese sticks or almonds. Have a Greek yogurt (it’s packed with protein) as an after-school snack. Have macaroni and cheese made with milk. Prepare canned tomato soup with milk instead of water. Add tofu or edamame to stir fries or soups. Include more beans (legumes) in your meals. Make lasagna or other pasta dishes with ricotta cheese. Top your pizza with cheese and vegetables. Have pudding made with milk or frozen yogurt for dessert.